Fantastic outdoor fun great for low impact exercise. Don't miss out on this fantastic offer. Be the envy of all your friends and ride around in style on one of our funky new Kiddo go-karts. EN-71 certified. 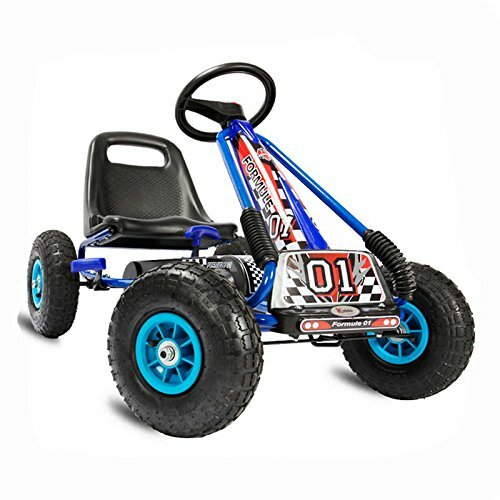 Ideal go-kart, suitable for ages 4 to 8 years. Fantastic outdoor fun, great for low impact exercise. Engage and neutral gear lever, hand operated rear wheel brake, fully enclosed chain for safety, rubber wheels, adjustable seat, easy steering, steel frame. Assembled Dimensions: Length 101cm, width 61cm, height 62cm. All measurements are accurate to the nearest cm. Maximum rider weight is 30kg. Colour: Blue. A wow factor gift. Value for money & fun. Looks great and definitely has the wow factor for a gift! Only down side is that my little one can’t reach the pedals yet. He loves being pushed around in it though! Amazing price and quality! My son was more than impressed and same goes for me haha! Bought for grandson and he loves it. Took a while to assemble but grandad did a good job!! Top class kart, quality and price. Great! 100% happy. Children (4 years old) love it! Really like these go karts. Love love love this go kart! Love, love, love this go kart! Thank you so much! It is my son's favourite outside toy, he loves it so much he would be on it every day if he could. The washers for the steering bar wore down, but after messaging the supplier they sent me new one's so I can fix it, they wore down due to use not due to poor quality. This go-kart is brilliant, the seat is adjustable so it will grow as my son grows. I would recommend this for anyone. Favourite toy in our house! Definitely a favourite for outdoors. For the money its very well made, what boy would not like this.